Despite my best efforts to avoid being called an “Apple Fanboi” I do somehow own a Mac Pro, MacBook Pro, Mac mini, iPod, iPhone, and now an iPad. In my defense, I’ve been using Apple products since about 1979, and have used them professionally in my work for about 17 years. I’m not the kind that runs out and buys anything Apple sells… but I do get what I think I need to do my work, or make my life more enjoyable/easier. With that disclaimer out of the way, I’ll start with this, the iPad is pretty amazing… at what it does. 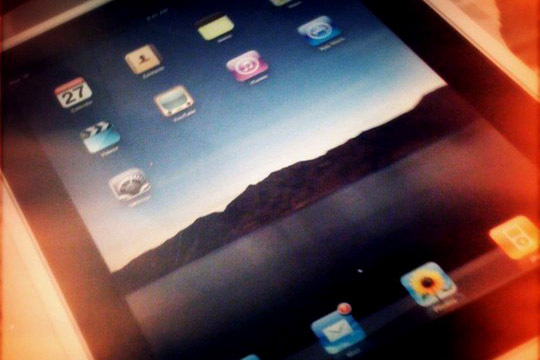 If you’re fine with the limitations of the iOS, then you’ll probably like the iPad. The typical iOS issues that bug me with the iPhone and iPod exist here as well, no access to the file system, the walled garden of the App Store, the closed nature of the device… that said, within the parameters of Apple hardware and the restrictive iOS, it’s a pretty stunning device. A few days after getting the iPad I was feeling under the weather, and ended up spending a lot of downtime on the couch and in bed, and in both cases the iPad really fit the bill as far as the device to use. Reading RSS feeds, wasting time with Twitter or Facebook, watching Netflix videos… the iPad excels at these tasks! I have not done much writing on it, and would probably not want to use it for extended writing of any sort. Speaking of writing, I did try to pair it with an old Apple Wireless Keyboard (using Bluetooth) but it didn’t work… the iPad would not pair with it as Apple does not support it. Charging is another interesting topic. You can’t just use the same charging methods you use with an iPod or iPhone. The iPad comes with a 10 watt charger. The plain old “USB Chargers” I use all the time don’t kick out enough juice. There’s a few notes I’ve found that talk about charging, but I’ve not dug into the subject very much yet. The battery does seem to last a long time… but also takes quite a while to fully charge up. All in all I’m really liking the iPad, and what it can do, as is the rest of the family. What would be nice? Support for multiple users, an upgrade that makes it more even feature-wise with the iPhone 4 (camera(s), slightly different design, etc.) a more open platform… but honestly, it’s a pretty cool consuming device, and for what it is, I’m very happy with it. Posted on Sunday, December 26th, 2010 at 3:24 pm. Subscribe to the comments feed. Both comments and pings are currently closed. Post on your own blog.